Three German “widow[s] of the resistance,” who spend time together at a run-down castle when World War II ends, embody aspects of the catastrophe that overcame their country. Germany, 1945: in this devastated landscape where “no one was innocent,” there is misery for all and plenty to spare. Guilt, shame, suffering, and silence go hand in hand as the German people emerge from war and fascism, and Europe is awash with displaced persons. Shattuck’s (Perfect Life, 2009, etc.) 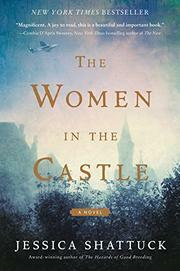 third novel centers on the von Lingenfels castle, a place of aristocratic indulgence in prewar years, now a ruined shell owned by Marianne von Lingenfels, the widow of Albrecht, one of a group of men who failed in an attempt to assassinate Hitler and were hanged. It’s this group which links Marianne to the two other women and their children, whom she invites to the castle for shelter: Benita Fledermann, widow of the charismatic Constantine, who survived the Russian occupation of Berlin but paid a heavy price; and Ania Grabarek, who walked west, out of the wreckage of Poland, with her two sons and is also keeping secrets about what she has seen and done. In this primer about how evil invades then corrupts normal existence, Shattuck delivers simple, stark lessons on personal responsibility and morality. Inevitably, it makes for a dark tale, more a chronology of three overlapping, contaminated, emblematic lives than a plot. Some final uplift does arrive, however, via the views of the next generation, which apply a useful layer of distance and some hope on the sins of the fathers—and mothers. Neither romantic nor heroic, Shattuck’s new novel seems atypical of current World War II fiction but makes sincere, evocative use of family history to explore complicity and the long arc of individual responses to a mass crime.